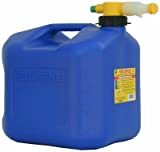 The Eagle HDPE laboratory safety can is used to safely store, transport, and dispense flammable liquids and has an oblong shape to help conserve shelf space. The can is made of HDPE (high-density polyethylene), which weighs less than steel and is resistant to dents, punctures, and certain chemicals. The fittings are made of stainless steel, which is resistant to rust and corrosion. A stainless steel flame arrestor helps prevent liquids inside the can from igniting and keep flames from spreading. This safety can may be available in different colors (red for gasoline or other flammable liquids, white for acids or corrosives, or yellow for diesel) to separate, store, and identify different liquids. 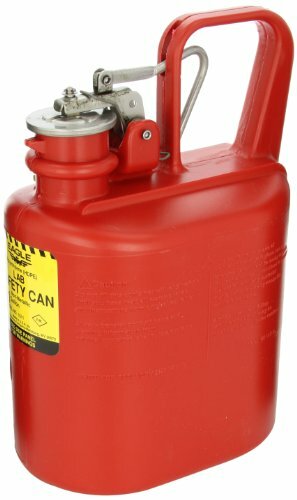 This product is FM Approved as a safety can used for handling flammable liquids in quantities of 5 gallons or less. It complies with Occupational Safety and Health Administration (OSHA) Standard 1910.106 for the safe storage and handling of flammable liquids. It also meets National Fire Protection Association (NFPA) Code 30, which provides safeguards to reduce the hazards associated with the storage, handling, and use of flammable and combustible liquids.